Hi. Great card. I adore this colour combination. I love how you have used the gemstones on the heart. Just fabulous. I will be joining in with the challenge also. Awesome card Anj! It's really stunning with that color combination...great card! AWESOME!! What a fabulous card!! Love the colors and all the bling!! Just beautifully done!! The MMDesign Team thanks you for playing in our challenge this week!! I really like this card! Love the colors! What an AWESOME card, LOVE it!! Hey Angela -I find those square stones on the heart so intriguing. They add a delightful visual to your card. Your color combination is excellent and all the little details are just magnificent. Thanks for playing along with us this week. Here at Midnight Madness we enjoy your friendship and love having you as part of our family. 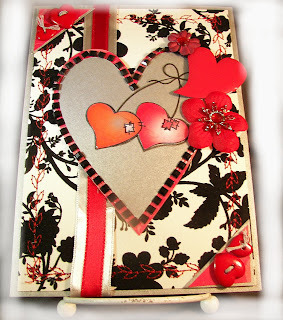 Love your card with those hearts on there. Your DP really is striking as background. 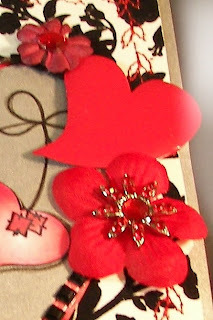 Love all the embellishments, thanks for joining us at Midnight Madness. This is beautiful!! The black, red and white color combo is exquisite! 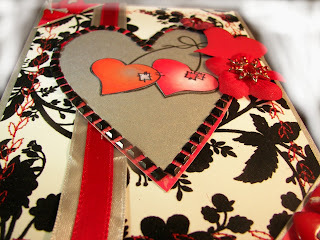 Love your coloring of the cute heart image and your embellishing and paper!! Thanks for joining us at Midnight Madness. You did a great job with the sketch. This s A Gorgeous card!!!!!!!! !